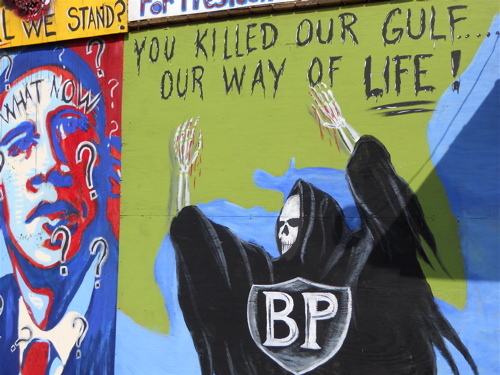 Outside Southern Sting Tattoo, 60 miles south of New Orleans, in Larose, La., anger spills over about BP’s role in ruining the lives of so many locals. Having never worked on a television show before, much less one involving reality programming, a bit of trial and error was to be expected. It all sounds so glamorous, but when you consider the task of finding a single person that fits the show’s criteria, out of a four state region, who is interesting enough to build a television show around, some of the shine comes off this diamond. It becomes an investigation. 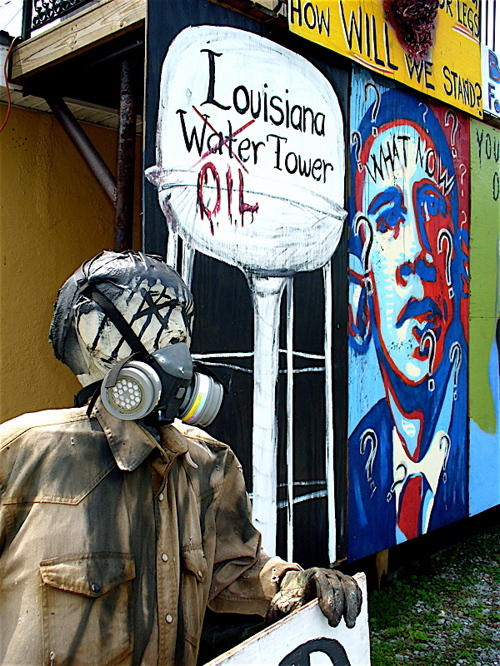 A mock-fisherman soaked in oil, wearing a gas mask to ward off fumes from the polluted fishing waters of Louisiana, is part of the display outside Southern Sting Tattoo. I was looking for someone involved in law enforcement, who is a little crazy and operates outside the box. The person needs to reside in a small community, but one where enough action occurs for it to be interesting. And most importantly, this person must be large and in charge! At some point it’s time to stop planning, organizing and preparing. The only way to get this project rolling was to get out there and start talking to people. But this is a strange role I’m playing, and it is a role. I’m no salesman. I can chat people up when I’m hanging out, and can take people to that next level in a nightclub setting, but to come strolling into police stations, casino security offices, off-shore oil platform offices, random bars and cafes, in rural southern states, cold and uninvited, with a pitch about looking for a reality television show candidate, that required putting on someone else’s skin. 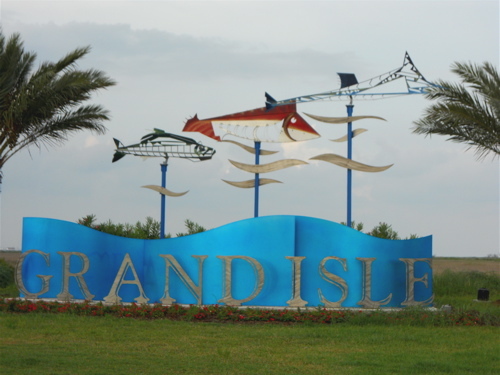 Welcome to Grand Isle, gateway to the Gulf, located 120 miles south of New Orleans. I might as well have been peddling lottery tickets. I was seeking some unsuspecting person to pluck out of the obscured masses and turn them into some quasi-famous reality star. A pitch like this doesn’t sound real. People look at you strange, as if you’re offering something too good to be true. I needed to get my spiel down before heading out to the more fertile ground of south Louisiana, where I felt hunting for this person would be more fruitful. I needed to tighten and polish my content and delivery. 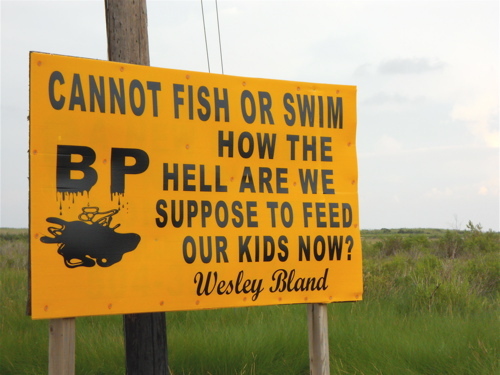 Venom for BP is posted along the road approaching Grand Isle. To get my feet wet, I checked with contacts around New Orleans, police and security organizations, to see if any of them might have colleagues, friends or relatives living outside the New Orleans-metro area, but no luck. Divine inspiration helps steel the will of local residents. After a couple days I had exhausted my possibilities in New Orleans, but was comfortable with walking into anywhere and giving my pitch. Now it was time to get out of my comfort zone and head south into the bayous, where the weirdness factor would go way up. 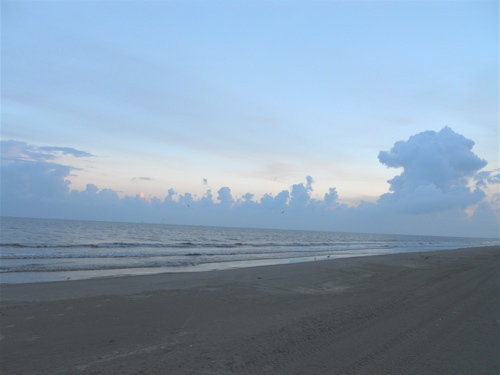 I first elected to re-trace my path to Grand Isle, where I had traveled previously to write a story on the BP oil spill. Once you clear Houma, located 60 miles south of New Orleans, the highway ends and Louisiana One (LA-1) picks up, which is only two lanes. It winds through a variety of small villages and townships, like Larose, Cut Off, Galliano, and Golden Meadow, before the road ends at Grand Isle. These towns all fit the size and demographics for where I might find somebody for the show, but there is little action in these areas. Most of the law enforcement in these towns operate speed traps to catch the city folk racing down or back from the fishing mecca that is Grand Isle. Not exactly scintillating television. 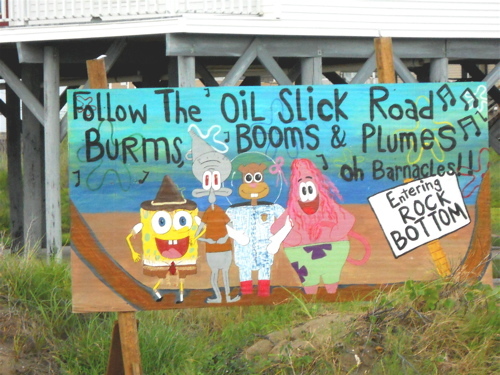 Grand Isle resident Darleen Taylor allows Sponge Bob and his friends to speak for the frustrations felt by locals after the BP oil spill. What I found were Goth-inspired tattoo artists, angsty want-to-be mixed martial arts fighters, bored police officers, unemployed fishermen, and pissed off marina, restaurant and hotel owners. 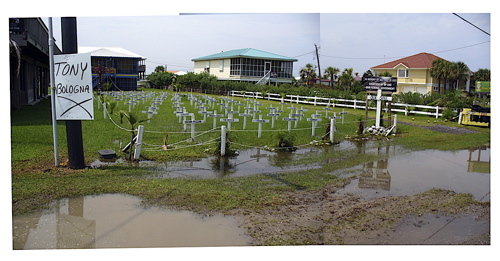 The BP graveyard set up in a Grand Isle resident’s front yard in July 2010. 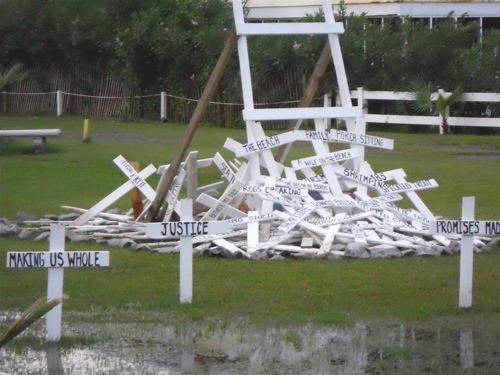 The reality in Grand Isle, and all along the road leading south, was BP’s oil spill had delivered a serious blow to these communities still recovering from Hurricane Katrina. They rely on fishing and tourism to survive, and that’s been true for generations. 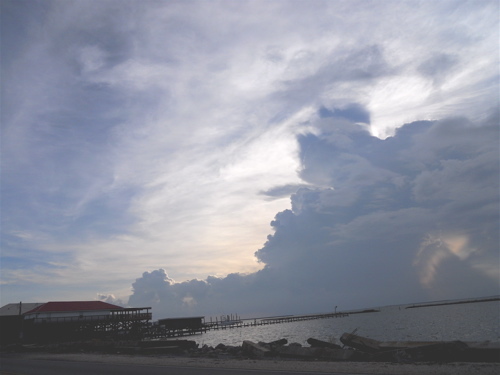 Within five years, all that had been wiped away by a hurricane and an oil spill. 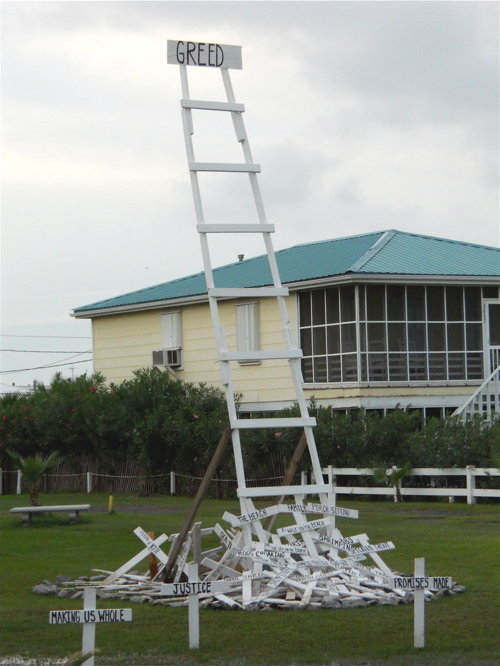 Grand Isle graveyard transformed, September 2010. The loss of a former life weighs heavy on local residents. 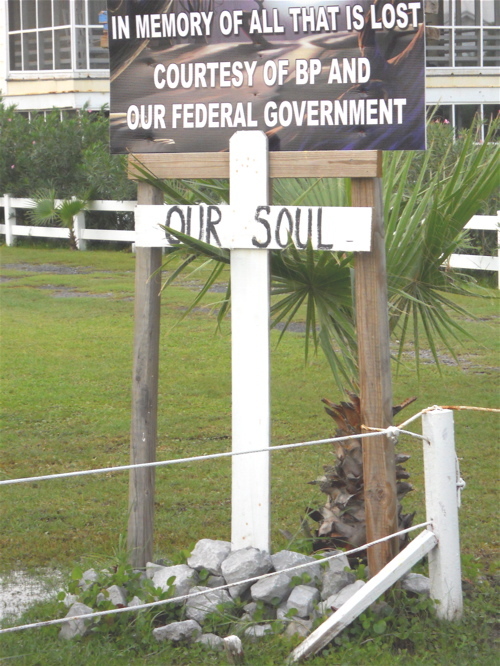 The soul of Grand Isle on display. In the end, these folks had plenty of reality in their lives without me trying to distract them with questions about eccentric law enforcement officers. I was able to talk with several interesting people, and developed some leads that would take me to Houma, La. next. 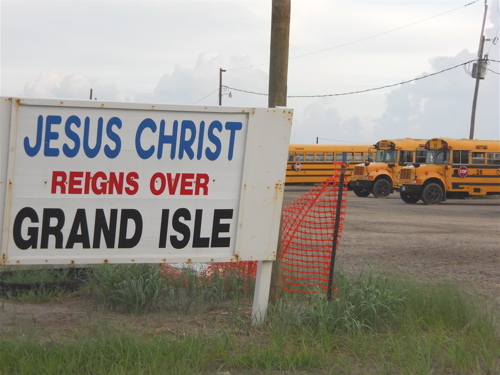 As I drove away I thought how ideal life had been in Grand Isle – and wondered who would be looking out for these people now that the news cameras had left. The beaches had reopened by September 2010. This entry was posted in Events, News, Travel and tagged BP Oil Spill, Galliano, Golden Meadow, Grand Isle, Houma, New Orleans. Bookmark the permalink.